Love from the Kitchen: Halloween Treats! 2. 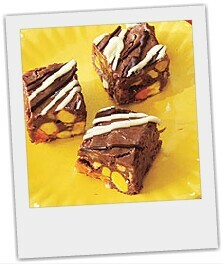 Remove from heat and stir in candy corn, chocolate chips and peanuts, stirring until chocolate melts. Immediately transfer to foil-lined pan and smooth top until even. Chill until set, at least 2 hours. 3. In separate bowls over pans of simmering water, melt semisweet and white chocolate, if desired. Using forks, drizzle both chocolates over fudge. Cut fudge into squares. Pretty tasty - though I think without the saltiness of the peanuts they would be too sweet. They didn't last long in the office kitchen! I could eat anything with candy corn involved! This is an IMPORTANT Day! Tuesday Garden Party - Where Did They Go?